I hope all of you are doing well, and if you’re in the States I hope that that your 4th of July Holiday went great. I’d like to thank everyone for the kind words concerning my “Car Wash / Warlock” segment. When you do something derpy like that you never know if people will enjoy it, or think you’re a nutcase. Maybe they’ll just think you’re a derpy nutcase? Either way, thank you all so much for the kind words. I blame Pandora for inspiring the idea behind that segment. I was having lunch reading the forums and listening to some music station on Pandora, and the channel happened to play the song Car Wash in the background when all of a sudden, “Bam!” The odd idea just popped into my goofy head. That’s how inspiration and motivation often strike me and there’s little I can do to stop it from happening. 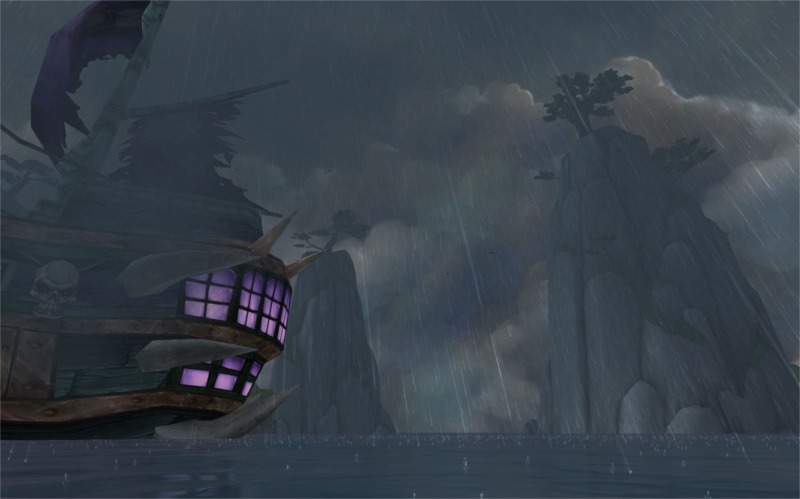 It’s that time during an expansion when I like to think it’s the calm before the storm. 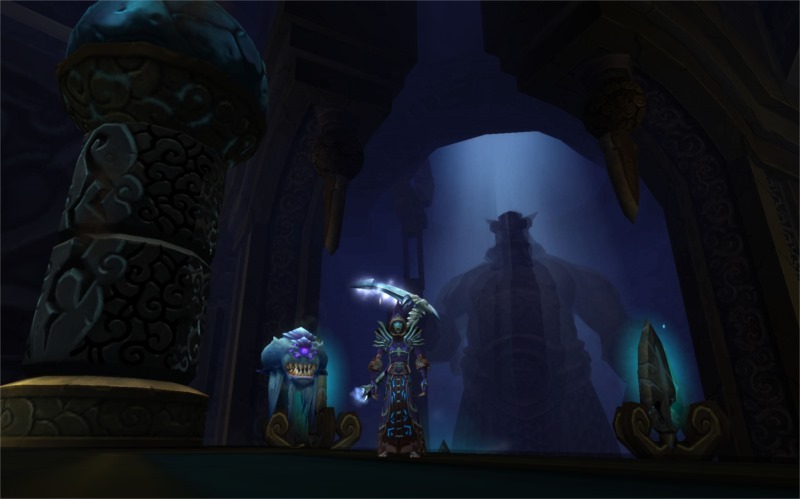 There’s a lull in the game play as patch 5.4 is still a ways off from launch, and people are busy clearing content and leveling alts to pass the time until the new patch hits. I have to admit that for me, it feels like I can finally take a deep breath. And a much needed breath it has been too. I’m enjoying the constant rush of new content at the faster pace Blizzard has been providing it, while at the same time I’ve been feeling a bit overwhelmed when I try to find the time to run my alt characters. I’m thankful that this small break or lull in the action has given me the time to catch up with what I want to accomplish in game and to refresh my focus. 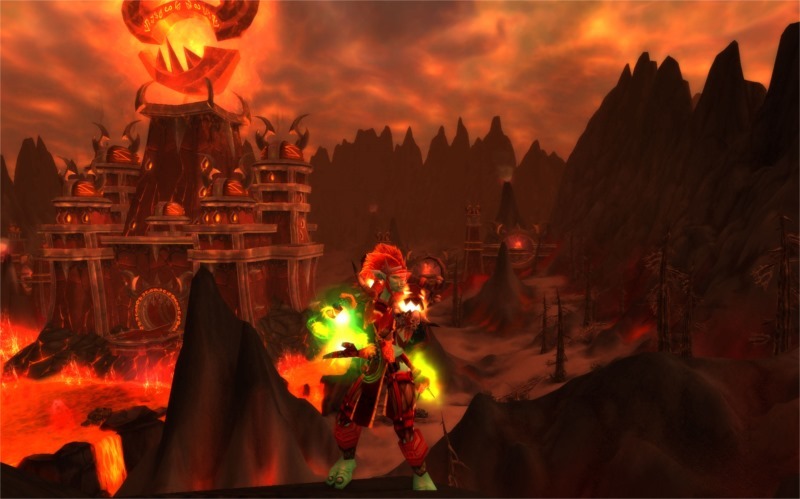 My goal is that when 5.4 hits, all six of my toons will be LFR geared for all of the latest content. That way, I can hop on any one of my home servers and jump into any group who might need a dps or heals. I’m getting close to that goal, but I still have a lot of work to do. I find it odd that sometimes it seems like gear drops on every single boss, then the next week it’s absolutely a bust. *Sighs* Such is life when it’s balanced around RNG whether it’s in game or not. Being a social creature, I love to see other people having fun and being creative in their own way. So I’d like to take the time to point out a few. Over on the Aerie Peak server I can’t help but mention @BelshnickleCTR and @Summer_Sal and the new video / podcast they have been producing called, The Converted Podcast. Shortly after the new CtR guild got up and running, these two began creating their show which highlights raid teams, players, and events within the CtR guild. They’re doing a great job and I find them both very entertaining as they carry their show. You can easily tell that both are having a lot of fun as they’re making it and it shows. I also can’t help but mention the crew over at the AIE Podcast (also a video cast too) that have consistently put out great content for the AIE guild over the years. @AcuZod, @Alludra_AIE, and @Shownotfound (Ghomus) will soon be recording episode #153 of the show and once again it’s a group that plays well off of one another. Since the AIE Podcast is all about the AIE community, they have been covering news and events for every game where AIE has a community. Bah! I forget how many games that now includes, but I can tell you it’s a lot. It’s enough where I think listing all of them would bore you, but you could probably mention every major game title, tack on 20 more and you might be getting close. When you add the AIE Steam community to that number as well it begins to boggle ones mind. While anyone can tune in to watch or listen to either of these shows, both are more focused on their members as compared to a greater mass market. Is that bad? No. It’s not. What it shows me is that they do what they do because they enjoy serving their fellow gamers. In her latest episode she talks it up with @Eljeppy, who I always enjoy hearing on whatever podcast he’s on. Jeppy has so many great stories about the game and it’s always entertaining to hear them, trust me on that one. Whatnot. I hear that word so much from WoW players I’m to the point that I’ve even found myself saying it now. I don’t know why but it reminds me of that Jerry Seinfeld episode with the “Yada, yada, yada” girlfriend of George Costanza. 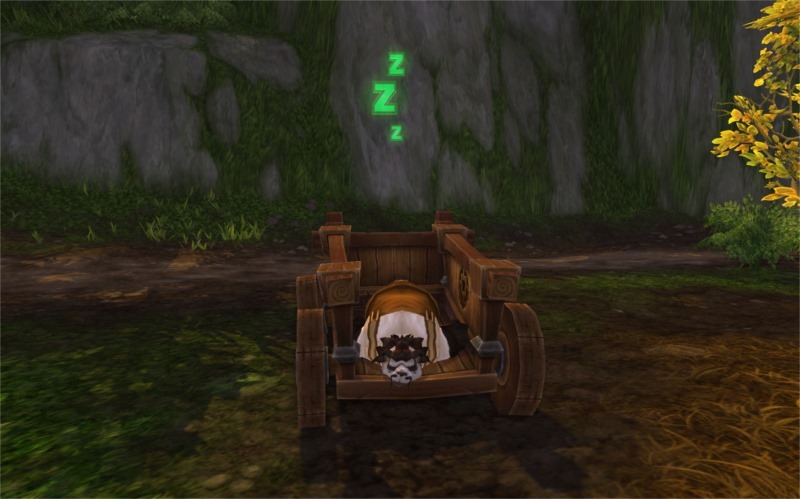 So usually when I login to WoW I’ll do some dailies, tend my farm, run something and whatnot. Well lately, the “whatnot” on Saturday nights has been running with Team Tweet Raid (TTR) helping other WoW twitter friends get achieves and tmog items from older content. TTR is run by one of my newest friends @Mementh who is the king of Re-tweeting what other people tweet that he finds interesting. Mementh is a good raid leader too. He’s patient and helpful in explaining the encounters out to the folks who have never done them before. 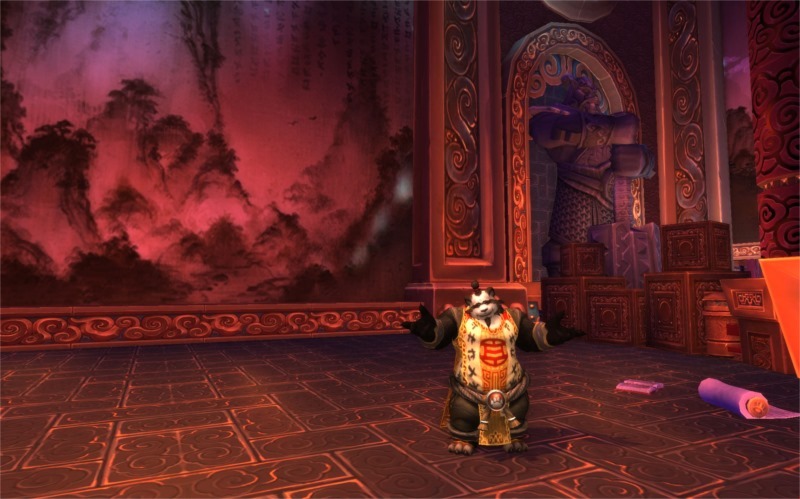 Team Tweet Raid also makes runs for both Horde and Alliance toons. It’s a lot of fun and it’s something different, and if you’re interested you should check it out. To join TTR is quite easy, just follow TTR on Twitter and DM @Mementh your Real ID so he can put you on the list. They even put out tweets before the run begins to remind people. I think it’s a creative way to bring new friends together to enjoy a change from what we normally do and whatnot! Gah! See? I keep saying whatnot now! So the golden calf (@Navimie) and I have been playing phone tag. Er…maybe I should say /w tag? Tweet tag? How about any electronic communication tag? The good news for me was that Navimie and I got a chance to talk for a little bit over on the Frostwolves guild chat on their new server. Yes, Oceanic servers still hate my internet. Yes, it took me about 20 login attempts before I could get logged in. 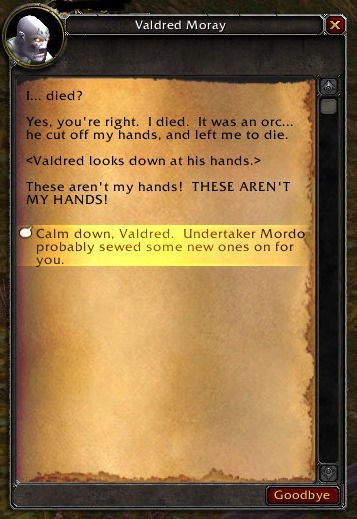 Persistance paid off because eventually I found myself on another level 1 warlock over at the Deathknell, in Tirisfal Glades on Oceanic’s Saurfang server vying for the good graces of Undertaker Mordo again. Navie immediately sent me an invite and derpy me got the opportunity to annoy chat with my home-away-from-home guildies, The Frostwoves. Navie was accomodating and adorable as always and for those of you who are going to Blizzcon you’ll be glad to know that she’s going too! Pics Navie! I want pics of everything! Btw, I love the new Frostwolf guild logo. If you haven’t kept up on the latest news, you really should go read up on what @Slowpoker / Poneria has been posting on WoWInsider over on her Blood Pact column. She’s been following the changes quite extensively and has been doing a good job of bringing up the discussion on both the good and bad. I’m still in the sit and wait mode. Who knows how much of our play style will change? I’m sure some warlocks may like the new changes and some of them won’t. You can never make everyone happy. It seems like every expansion launch there’s a ton of QQ with every class until people accept the change and change their views. Me? I still plan to be playing my warlocks. Also, a couple of posts back, Saga over on Spellbound had a great list of warlock gear that I forgot to mention too. If you need a quick shopping list of where you should be spending your time for an up in your gear, it’s a great list to check. Thanks for taking the time to put that together Saga! Linking all of those items takes some work! If you got a chance to hear my talk with Leeta on her Behind the Avatar Podcast you may have heard me talk about retiring. So if you would please indulge me I’d like to explain a couple of things. First, my RL job over the past few months has scaled up quite a bit. Basically, my workload has almost doubled, but I’m still doing my best at keeping up with my blog and my audio segment submissions. As it stands right now, I’m getting a post and a segment out every two weeks and I’m quite surprised I’ve been able to accomplish even that with my lack of spare time. My goal has always been to make a segment and a post 1x per week and since I’m the compulsive type it doesn’t make me feel better to know that I’ve had to cut back on them both. I don’t want to give up my blog or making my segments, but I have considered retiring from my audio stuff. As most of you know, I started my audio segments as a fluke shortly after starting this blog and they kinda took on a life of their own. I’m getting close to covering everything I can about warlocks for the MoP expansion which was my original goal when I began creating them. Another big factor that I have to consider is that my oldest will be starting her senior year of high-school in less than six weeks. It will be my last year having her in the house and it’s going to be tough when she leaves. She’s a great kid and she’s my weed (I say that affectionately). She can grow anywhere she finds herself planted and she thrives in any environment. I just know when she does leave one year from now it will be quite difficult to take. And so anything that might take away from any time we could spend together during this next year has me considering the importance of it all. 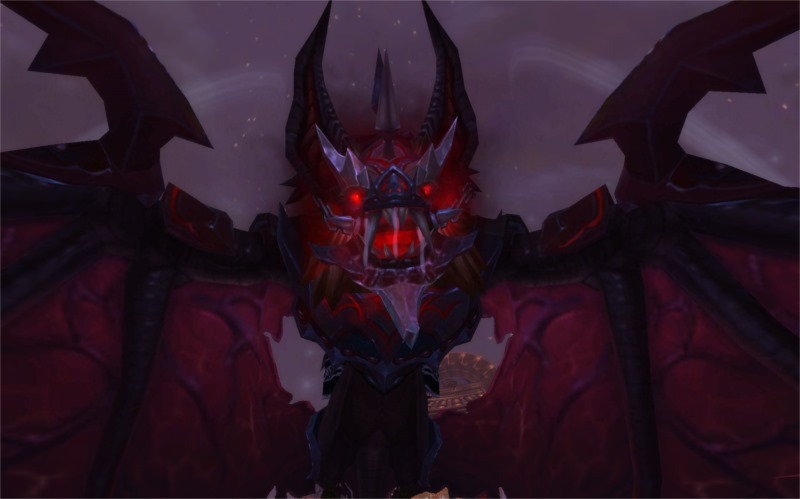 Next week will be a new Tmog review, and depending upon any late breaking or major news announcements then the week after that I plan to highlight another warlock in the Unleashing the Warlock Within series. Have a great week everyone! Once those weeds leave they never look back, this is good for them but so hard on the weedkeeper! Had a problem with WordPress tossing all my comments in spam folder. It thought you were spam! Ha! Yeah, this weedkeeper will be quite sad when one of his oldest weeds leaves (no pun intended). I’m jealous! I wanted that scythe on my Warlock for so long, but never got it. Happy for you though, cause it’s a really nice-looking scythe. We need more scythes in the game!! It’s a great looking weapon although I find the glowing white animation a little too bright at times to the point of being blinding. It’s very cool though :) kept it for a week or so and then I went right back to my Silver-Thread set. Yeah I have no clue why Oceanic is so tough on my computer other than the fact I’m in the Midwest? 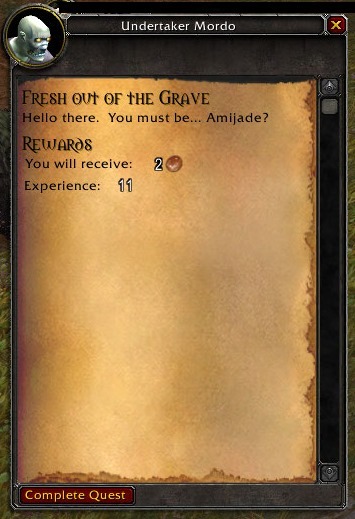 Omg, I didn’t realize that you’re on Saurfang too. When I come to visit Navie I’ll try to spam ya! 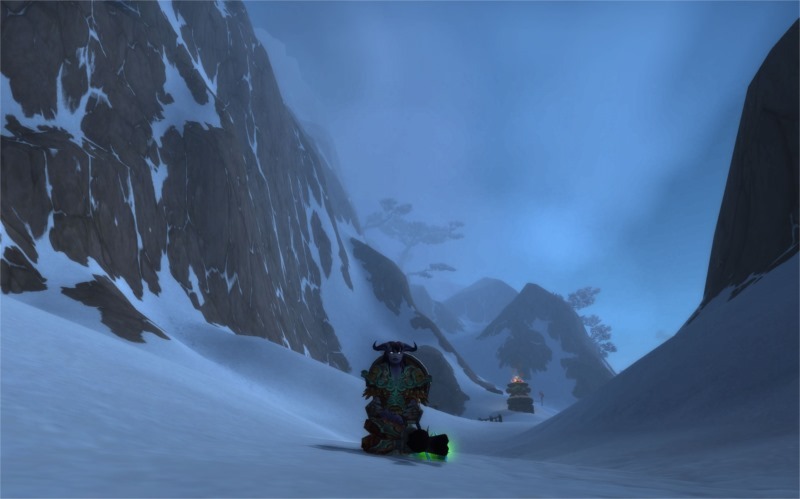 I’ll probably never level the toon very much and I just mainly use it as my portal to visit my friends The Frostwolves…and Navie of course ;) Now, I can maybe annoy…er visit you too! Ah what a great visit! I feel fortunate to have caught you in a moment of WoW :) It feels like I haven’t seen you in AAAGES. 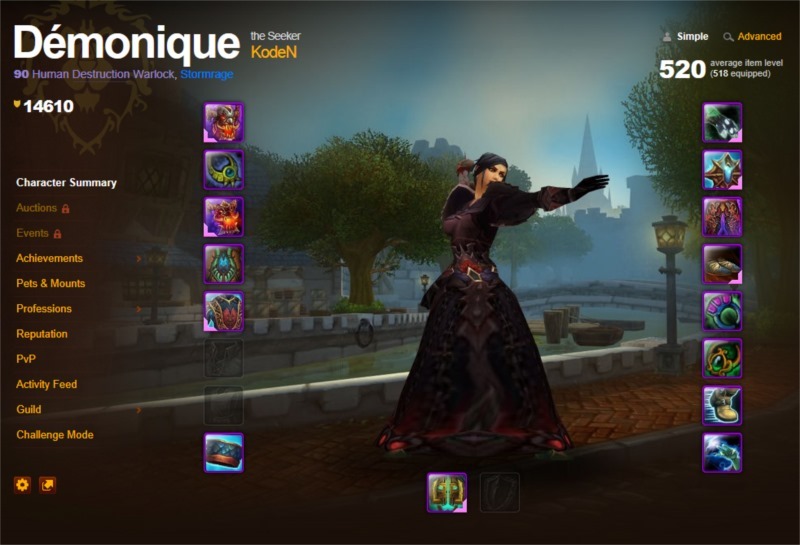 That LeetaWoW sure is something and I do like her – and she’s a warlock too! But trendy chatty warlocks are a little intimidating and I will be content just listening to her – I must admit I had not done so yet. I always enjoy our visits and yes, you should check out Leeta’s show. She does a great job! And a nice hat. Silly phone keyboard.